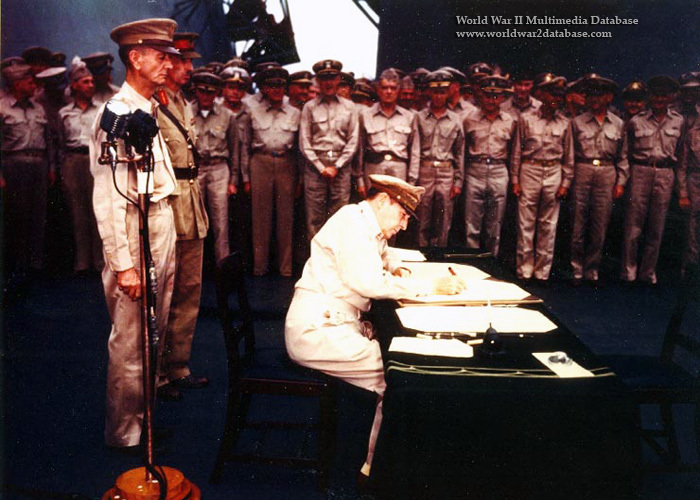 US General of the Army Douglas MacArthur signs the Instrument of Surrender, as Supreme Allied Commander, on board USS Missouri (BB-63), September 2, 1945. Behind him are US Army Lieutenant General Jonathan M. Wainwright and UK Lieutenant General Sir Arthur E. Percival, both of whom had just been released from Japanese prison camps. Officers in the front row are (left to right): US Navy Vice Admiral John S. McCain; US Navy Vice Admiral John H. Towers; US Navy Admiral Richmond K. Turner; US Navy Admiral William F. Halsey; US Navy Rear Admiral Robert B. Carney; US Navy Rear Admiral Forrest Sherman; US Army General Walter C. Krueger; US Army General Robert L. Eichelberger; US Army Air Force General Carl A. Spaatz; and US Army Air Force General George C. Kenney.